Are We There Yet?? : Good Mother? Total Pushover? The Debate Rages On! Good Mother? Total Pushover? The Debate Rages On! On yet another nasty January day in New England with Mother Nature being a real b*tch, I'm sitting at my computer debating whether I should qualify myself as a good mother or a total pushover when it comes to my kids as well as debating whether another cup of coffee might be in order. I think I can settle the debate on the second cup of coffee much easier than I can my parental status. Today was a late morning - in more ways than one - as I didn't get to bed until after 3:00 a.m. and didn't get out of bed until 10:00 a.m. The reason for the lateness all the way around had to do with two things - Amanda and the weather ... or maybe it was three things? Amanda, the weather, and my inability to just say "no". To try to put this in a nutshell, on Sunday morning Amanda woke up in a bit of a panic as it dawned on her that she desperately needed to get something from her room at the college before Wednesday and if she didn't get it before then, there could be dire consequences. With my landlady coming up from New York on Sunday afternoon to discuss the recent parking debacles with my neighbors, we couldn't make the drive up to Beverly then and I was going to be working my usual 16-hour dispatch shift on Monday so I told Amanda we'd take a drive up on Tuesday (my day off) to retrieve the desperately-needed item, take up some of the stuff she had accumulated over the break, and then maybe find a place to take some pictures as I can always find something on the North Shore to take pictures of. Tuesday was my day off so why not, right? Watching the weather on the local channels yesterday morning I knew there was no way I was going to be making the drive to Beverly today as I don't drive in snow, ice, and freezing rain. Unlike other foolhardy souls, I just don't do it and there was no way we would be heading up to the college no matter how dire the situation. It just couldn't be done. When I told Amanda this she went into major panic mode as she really, really, really needed to get this thing and she needed it before Wednesday or it could be really, really bad. Being the good mother total pushover whatever it is that I am, I came up with the next best solution to the dilemma and asked my supervisor if I could leave a bit early so that I could make the 4+ hour round-trip drive to Beverly and back before the bad weather moved in. According to the weather geniuses, the bad weather wouldn't be arriving into the area until after midnight so I figured that if I left work around 9:30 or so we could get to Beverly around midnight, Amanda could get what she needed, and we'd be back around 2:00 or 3:00 a.m. I knew I was going to be dog-tired by the end of the 250-mile trip but there didn't seem to be any other way around it as there was just no way I was going to even try to drive to the North Shore during a winter storm. When we got off of the Mass Pike it was actually rather nice to drive up I-95 with virtually no other cars to speak of and Route 128 towards the North Shore wasn't it's usual headache to navigate as there were only two or three cars other than mine on a road that is riddled with construction and uneven road surfaces. We pulled into the parking lot at Amanda's house at just a couple of minutes after midnight with the temperature reading on the dash now showing 9 degrees. Yea ... I was just going to stay in the warm car while Amanda went into the house and got what she needed. While she lugged in the container of things she brought back with her, I decided - what the heck- I'll just take a couple of pictures with my iPhone while I was waiting. Believe it or not, I actually found myself wishing I had brought the Nikon with me as I was thinking some night shots might have been interesting before I reminded myself that it was 9 DEGREES outside and I still had to make the 2-hour drive back home! Oh yea ... 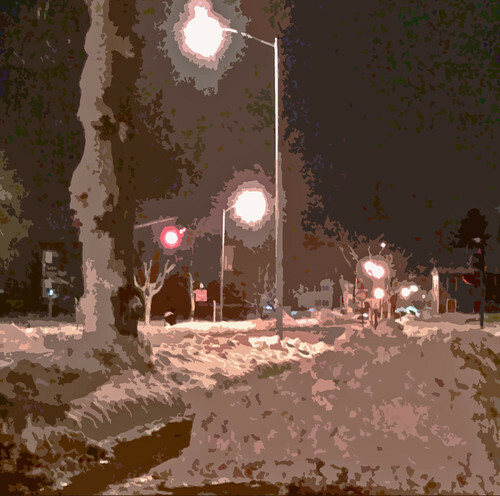 Anyhow, here are the two pictures I took with my iPhone doctored up a bit to make them more "interesting"! 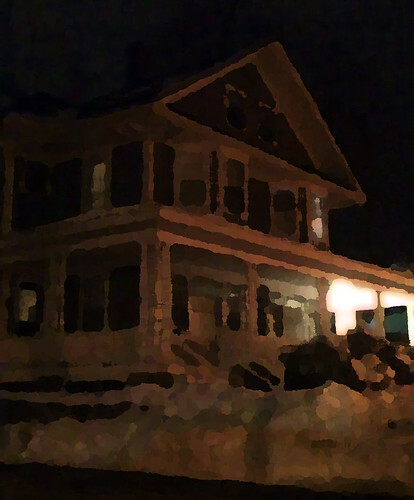 Amanda's house made to look more artistic by using a Paint Daub effect! After about ten or fifteen minutes Amanda came back out and we began our journey back to Connecticut. The weather was still holding pretty good, I had I-95 all to myself almost all the way back to the Mass Pike, and I was starting to get a bit sleepy. Not good. Once we got on the Mass Pike we stopped at the first rest area available so I could get a Diet Coke for a bit of a caffeine infusion; I really didn't want anything stronger as I wanted to be able to get to sleep when I got home. Amanda would have liked something to eat as she hadn't eaten all day due to her stomach being in knots over the whole gotta-get-to-Beverly thing but apparently even though there is supposed to be 24-hour services at the rest areas on the turnpike, there really isn't much to choose from. Once we got off the turnpike and began the trek back down Route 395 towards Norwich, I was able to make a quick stop at a 24-hour McDonald's just off the exit in Auburn that had a decent night menu so that Amanda could get a chicken sandwich and then it was back on the road for the last 50-miles of the trip. Oh wait, was that snow I was starting to see in the headlights? Gee, it looked suspiciously like it and it was starting to stick to the road in spots. Krap on a stick! Fortunately the weather didn't worsen but once we got to just about 20 miles from Norwich, I started having some major issues with being able to watch the road ahead of me without feeling like I was going into a trance. I felt like my eyes were barely open and the lines were starting to blur together like reflective lane lines do! Having made that drive over and over and over again I was very familiar with where I was and how much longer it was going to take me to get home but wow - it never felt like a longer drive! When I pulled into the driveway it was 2:55 a.m. and starting to look a bit like we'd driven into a snow-globe but thankfully the roads hadn't been bad at all and we were back safe and sound from our late-night journey to the North Shore. When I told Amanda that I was glad I didn't have to drive any further as I'm not quite sure how I made it the last 20 miles she seemed surprised as she said she couldn't tell from my driving that I was having trouble staying awake at all. I guess that's a good thing? Either way, it's definitely something I really don't want to do again anytime soon regardless of how well I managed it! When I looked outside at my car this morning after I dragged myself out of bed at 10 a.m., it looked like it was covered in a nice layer of ice so all things considered it's good we made the drive when we did. Amanda felt very bad that we had to make the drive up at all and is very appreciative that we did but I still have to wonder about that whole total pushover or good mother status. Maybe I should just chalk it up under the category of "the things we do for love" and let it go at that? Ah well ... I think I'll go get that second cup of coffee now and go back to cursing the weather, it might make me a feel a bit better even though it won't do any good! Oh, and please do me a favor and keep your fingers crossed for good weather on Sunday when I have to drive back up to Beverly yet again to return Amanda at the end of her college break - rumor has it there may be more snow in the forecast that day! Good mother certainly applies to you. Pushover does not. Glad you're safe but you must be exhausted. You're getting sleet. We just dealt with that. Not fun. You're a real good mother, and certainly not a TOTAL pushover! Yep, you're a good mother with lots of common sense. That's why you went after work last night. Now it's done and you don't have to battle the weather. As I've said many times, you're a great mother! The things you do with and for your kids are wonderful and they will always have these fond memories and be most appreciative. Honestly, I'm pretty sure I would not have done the drive to Beverly in the middle of the night unless it was life or death, as I dearly hate driving in the dark. You're not a pushover honey you're just a D.A.M.N. G.O.O.D. M.O.T.H.E.R! You're a MUCH better mom than I was! Well Linda, considering Mandy and I had our third day in a row of providing meals on wheels for someone already on wheels, who would I be to critique you for your going on that drive for your daughter! Monday night, we provided Sonny Boy with a container of hot corned beef and cabbage plus potatoes and carrots and a couple slices of buttered bread. Tuesday he dined on cold sandwiches that Mandy took up to him and today, I heated up a container of stuffed pepper soup, fixed him two turkey ham and cheese sandwiches, dipped out a little container of homemade rice pudding and sliced up a half a loaf of homemade Swedish white bread along with some slices of hard salami and a few slices too of Bondost Swedish cheese for him. On the way up to meet him, Mandy was to stop at my friend, Mary Kaye's house to pick up some other "good-for-you-but-snack" type items as well as a package of apple danish she happened to have at her house. She's also going to look around her storage area to see if she can find a small cooler she thinks she still has as well as a large thermos and maybe even a smaller, fat one that would work to hold hot foods -casserole stuff and/or soups! (She kind of regards him as her second son so he's one lucky fella to have both of us feeding him and his sister running the delivery service to him. Granted, it's only 4.5 miles, one way, up to the truckstop here, but lucky for him -and us -we didn't get hit yesterday or this a.m. with the freezing rain mixture other areas around here got. However, it's now snowing lightly here, so who knows what tomorrow may hold, ya know! The only nice thing about his employer running him like this is that it is saving me a little over $10 a day for gas for my jeep for him to drive back and forth from home to the company's terminal! Damned gas hog jeep anyway! Enjoyed reading your blog which I stumbled on quite inadvertently. I, too, am a Connecticut mom with a college daughter. Enough said! you deserve a vacation more than anyone i know! If you call the vote, put me down for good mother. You know your kids, and you know that making the drive was better in the long run than having Amanda worry herself sick over what she needed. So you get the step-over-lip-lock-gold-star points for that. Besides, didn't you just work some massive OT? So you deserved to check out of work early to do a solid for your kid.